I LOVE soft pretzels. I mean, they are a combination of two of my favorite things: bread and salt. What could go wrong? I even have a favorite soft pretzel vendor... weird, huh! In high school, I used to make soft pretzels all the time, but I fell out of the habit after I went to college. The recipe I used required a long rising time, which isn't difficult, but I'm all about instant gratification—I want snacks that don't take a huge amount of foresight! So when I found a recipe that required NO rising time, I knew I had to try it. This recipe is for non-risen pretzels, but if you would prefer to let yours rise, simply allow to rise 2-2 1/2 hours after kneading dough. With this method, you can skip the boiling water bath and simply brush pretzels with warm water that has baking soda in it, then put them right in the oven. Preheat oven to 475 (be sure to do this at the beginning, cause it takes awhile!). Grease cookie sheet. Fill a medium saucepan with at least 3 inches of water and add about 1 tsp. baking soda for each cup of water. (I usually just estimate). Put on stove to boil. In the bowl of a stand mixer (or in a normal bowl if you're feeling really buff), combine water, yeast, and sugar. Add flour (I usually put in about 4 cups, then let it mix for a minute, then add more if it needs it) and knead until you have a soft, elastic dough that isn't sticky to the touch (if you use half wheat flour, it will be slightly sticky, but not much). On a clean countertop, pull off small sections of dough (mine are usually about the size of a clementine or a bit smaller) and roll into long snakes—yep, just like you used to do with playdough. For best results, you want your "snakes" to be about half an inch in diameter. Cross ends to form a traditional pretzel shape, and press dough together in the three places that it meets (this will keep it from all falling apart in the boiling water bath). To get that perfect pretzel shape, slip two fingers through the top loops of pretzel and carry it over to the water bath that way. Gently boil for about 30 seconds, then remove and place on cookie sheet. When all of your pretzels are done, brush with beaten egg white (if you don't have an egg you can use a cornstarch wash—1 T warm water to 1 T cornstarch—but it isn't quite as good for this) and sprinkle with coarse salt. Bake for 8-10 minutes, or until pretzels are a deep golden brown and no longer doughy on the inside. Let cool a few minutes before trying to get them off the pan—in my experience, they come off better when they're cooler. 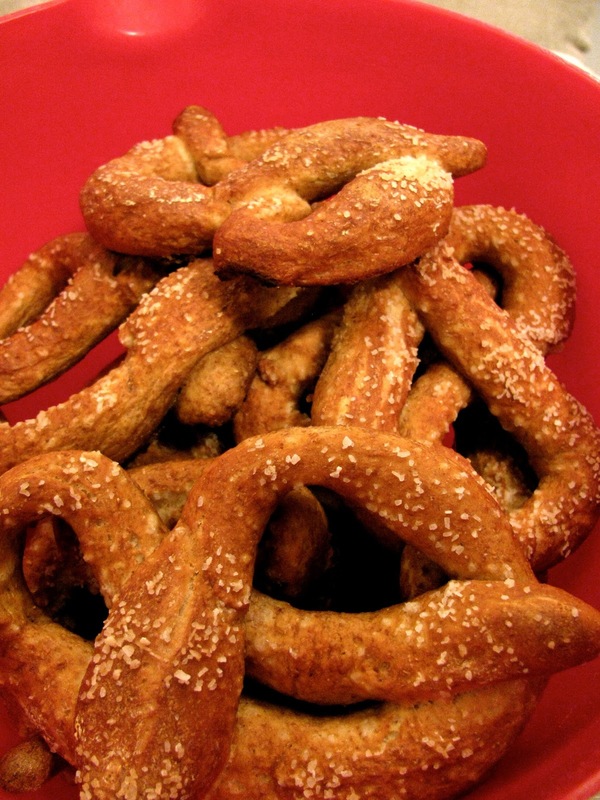 Before eating, brush warm pretzel with butter (and if you're me, sprinkle MORE salt on it!). Enjoy! This recipe would also make great bagels (just shape your snakes into circles, boil them, and omit the salt on top). For other pretzel flavors: I like my pretzels as salty as possible, but if you prefer other pretzel flavors, feel free to switch things up! For cinnamon sugar bagels, omit the salt, brush with butter when they're out of the oven, and sprinkle with cinnamon sugar. For parmesan pretzels, omit the salt and sprinkle with parmesan after doing the egg white wash. You can really do anything you like with these - use your imagination!